Recently, I have had several questions about intelligence in children with cerebral palsy and other early neurologic injuries or diseases. The key issue is whether or not you believe that “smarts” are a fixed characteristic or a trainable skill. 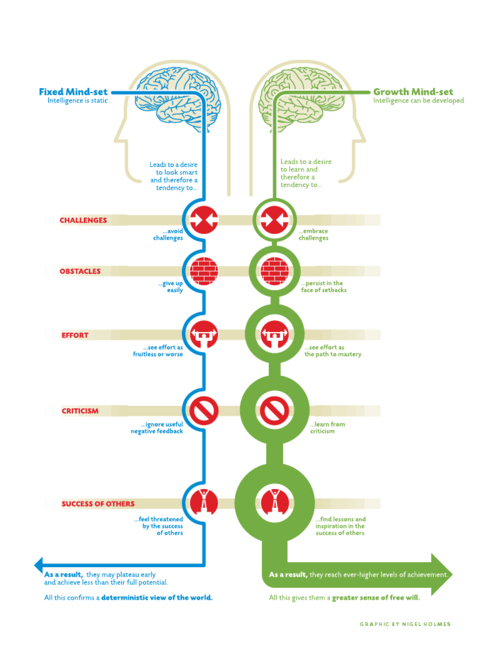 This image, by Nigel Holmes encapsulates the key differences between a fixed or a growth mindset. I have written about Mindset, Carol Dweck’s important book before. Your expectations influence your own life and also limit or enlarge your child’s potential. Three years ago, I wrote about a completely unethical research study done back in the early days of intelligence testing. It was discussed in an undergraduate psychology course on motivation. In the study, children moving to middle school were IQ tested and then assigned into different classrooms based on the results. Parents and teachers were told that the children in Group 1 were super smart and the children in Group 2 were average or below. Not surprisingly, Group 1 aced the year-end tests, while Group 2 did not. If a child is behind in social interaction, speech or language skills, you really only have three options. The first option is that you can accept the prognosis that the damage is permanent and irreversible and set low expectations. In my experience, this guarantees a poor outcome. Children are adept at living up or down to our expectations. The second option is to try to treat him “normally”, what ever that means. The problem with trying to normalize your interaction is that the child’s response is not normal. Life with your child becomes a saga of failure to be “Normal”. A third option…taught to me by a very bright and committed mother is a willing suspension of disbelief. Her daughter was very severely involved in both motor and cognitive skills. As a baby, it was hard to even know if she was responding to the world around her. This Mother decided that her child was a super bright being, trapped inside a body that could not respond. This choice of “Mindset” totally changed her interaction with her child. She chose to believe that her little baby would grow and learn and enjoy whatever life provided for her. I have copied the mindset image at the top of this post and will refer to it as suggested by Milisa Burns in her blog. http://milisaburns.com/2014/01/20/a-growth-mindset-why-we-all-need-one/ I consider myself to be at the optimistic end of the human spectrum, but it is good to remember that challenge is just an opportunity to grow. Thank you so much for sharing. I am a retired special educator who was often reprimanded for planting false hopes in the parents of my multi-handicapped students. I still work with folks with autism who are unable to speak. They are all intelligent and want the world to know it! You are so right! One of my favourite teachers, Dr Bernie Segal, said “There is no such thing as false hope, there is only false no hope”. Thank you for your comment. I thrive on viewpoints like yours. I wish more physicians and educators were like-minded. My son has Angelman Syndrome and has trouble controlling his body, including, getting his words out. I believe he has great capacity to learn and he has already proven it to me. The trouble is, getting educators to abandon their testing and other methods which limit the style and pace for instruction. Thanks for your comment. I think Carol Dweck’s book, Mindset, should be required reading for educators of special needs children. Change in systems often seem glacial, but in the interim, buy the book for a teacher. Change happens one person at a time. Karen – kindly request that you site the “unethical” study referred to in your article. Although, I appreciate the intent of the article, it is obscured for me by an uncertainty about the reality of the study. Sorry to question it, but it sounds like an urban myth and that is why we site in academic works. Sincerely, George Gerken, proud father of a college age daughter with CP who was on the dean’s list last semester. George – Thank you for your comment and congratulations on your daughter attaining the Dean’s list. A great accomplishment. If you scan my site, you will find that I do include links to referenced articles whenever I can. This particular study was discussed in a course on Motivation given by Prof Ronald Melzack in the early 1960’s at McGill University. I think it unlikely to be an urban myth.However, less intrusive studies have been done by Carol Dweck, PhD and published widely. Her book, Mindset, discusses the power of expectation in many situations. I hope this partially answers your question.